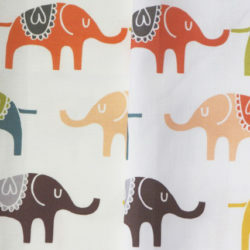 We love seeing what you create with your Spoonflower fabric, and we jump at the chance to share your special projects! 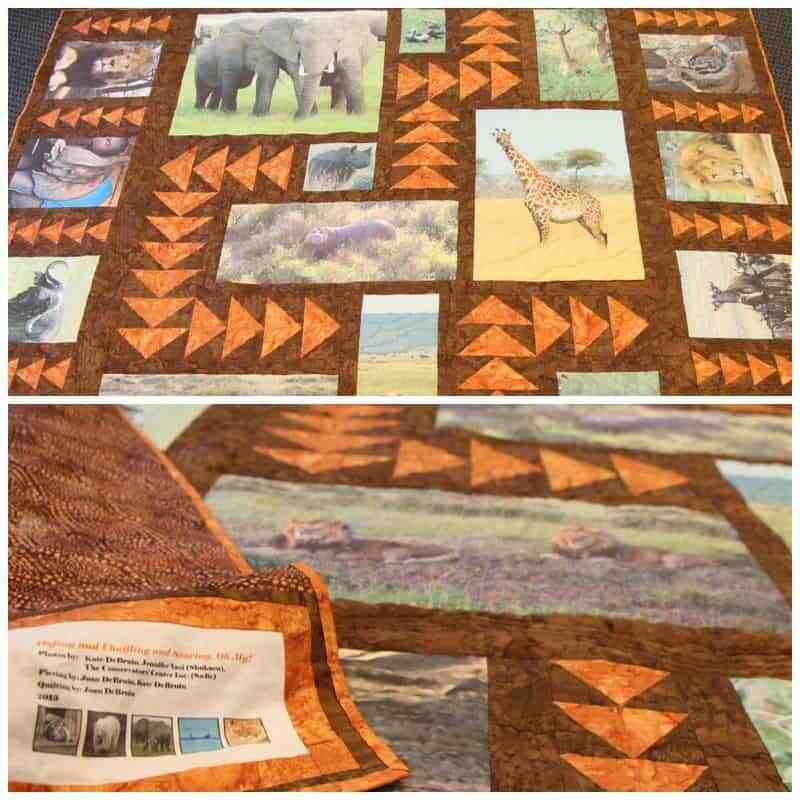 Joan and Kate, a mother-daughter team whose craftiness is enviable, collaborated to create a quilted scrapbook of their safari trip to Zimbabwe + Tanzania, and we are delighted that their masterpiece will be on display at the upcoming Sandhills Quilters Guild show in Pinehurst, NC. Read on to learn more about their creative process! Kate's photos showcased in the layout with a customized label on the back. Who doesn't love a creative way to enjoy photos?! This amazing safari photo quilt showcases gorgeous shots of the animals Joan and Kate spotted on their travels in a way that warms both the heart and the bed. Kate took care of the quilt top, designing the layout to showcase her amazing animal photos. The Spoonflower-printed photos are surrounded by simple and beautifully pieced flying-geese blocks. KATE: This queen-sized quilt was a collaboration between my mother (piecing and quilting) and I (design, photos, and piecing), and it is now the centerpiece of my African-themed bedroom. The photos are from my trip to Kenya and Tanzania in 2011 and the lions and tigers my mother and I adopt at two local exotic animal rescues, the Conservators’ Center in Mebane, North Carolina and Carolina Tiger Rescue in Pittsboro, NC. The photos were printed on Spoonflower’s Basic Combed Cotton because it has a higher thread count than the Kona quilting cotton, and I was absolutely delighted with the color and the level of detail. The largest photo is 24” square, so I did have to get some help from a friend to make sure the pictures had enough pixels to meet the minimum resolution requirement of 150 dpi. If you’d like to print photos for a quilt or other project, I recommend making them about 1” larger than your planned final size (both height and width) to account for the seam allowance and give you some ‘wiggle room’ if the design doesn’t print squarely. Finally, be aware that black prints as dark grey [on the Basic Combed Cotton], so if you’re quilting you may want to use charcoal-colored thread instead of true black. The back actually features a legend identifying the animals and the photo locations! From Kate: The quilt and animal legend were designed in Excel, and the label was created in PowerPoint. I originally made the legend to ensure that we put the quilt together properly, but I liked it so much that I added the photo locations and made it a permanent part of the piece. The legend is like a map of the quilt, identifying the photos and where they were taken. With the top complete, it was time to pass the quilt along to Joan for the finishing touches. 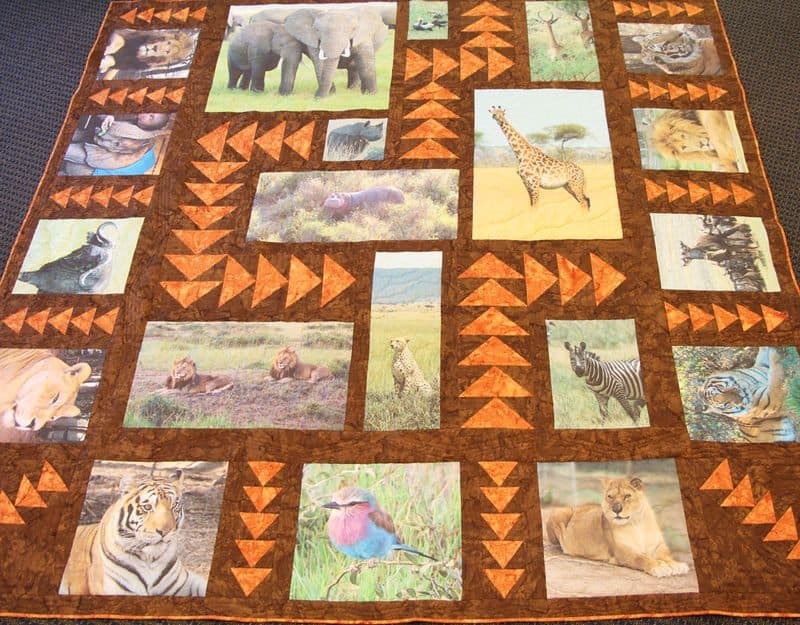 With her longarm quilter, she intricately outlined details for each animal and photo. Blades of grass, a lion's maine, and the feathers of a bird all came to life with her amazing creativity and attention to detail! A closeup of Joan's amazing quilting. 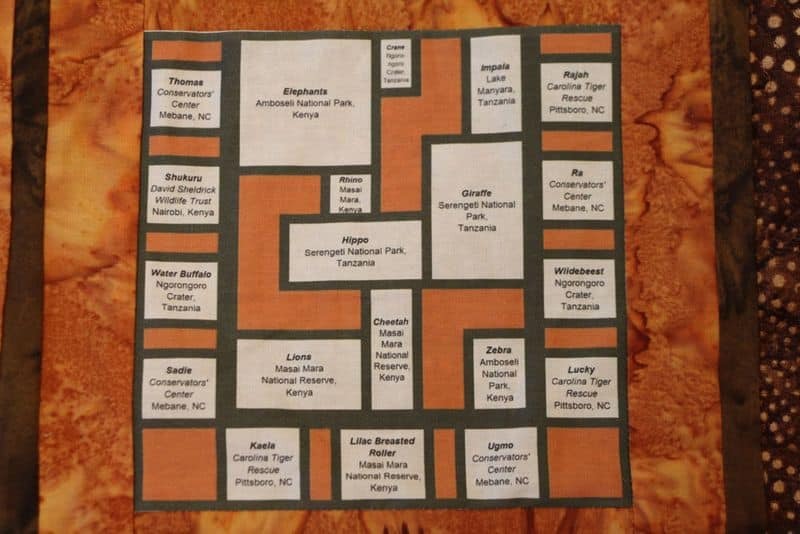 Joan is an active member of the Sandhills Quilters Guild, and she has entered this amazing safari-inspired quilt into their upcoming show Quilting in the Pines, happening next Friday, September 26 and Saturday, September 27! If you are in the area or planning a weekend trip, please do make a pit stop in Pinehurst, NC for this great show, and get a better look at the amazing details and features of this quilt and so many others! 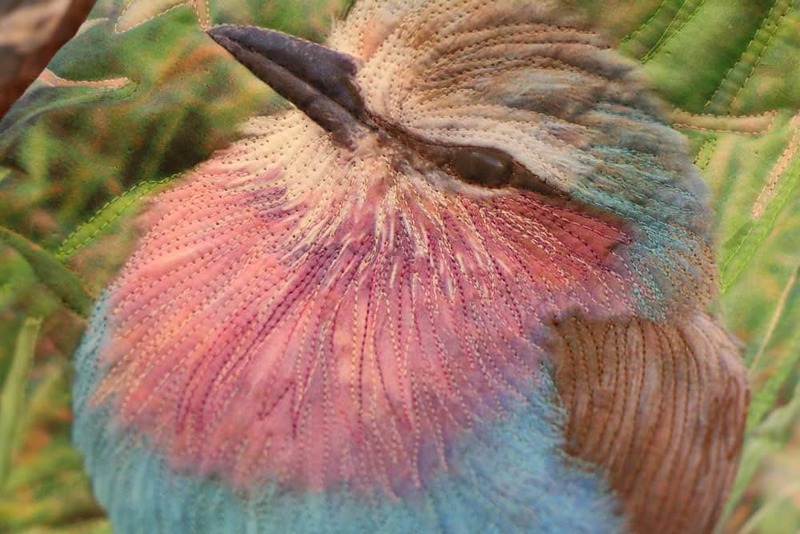 Have you printed photos through Spoonflower? We'd love to see your projects and your favorite "out of the frame" ideas for photos in the comments! We’re giving away a copy of Weekend Sewing by Heather Ross! 12 DAYS OF GIVEAWAYS: Day 5- Win Fiskars Amplify® Shears!